The centerpiece of the international space station is set to be attached to the orbiting outpost today by the astronauts of space shuttle Atlantis during a action-packed day that will feature a six-hour spacewalk. This morning astronaut Marsha Ivins will unlimber the shuttle's 50-foot-long robot arm while Tom Jones and Bob Curbeam prepare for the first of three planned spacewalks, or EVAs. Before Destiny can be attached to the Unity node's end hatch, Ivins must remove PMA-2 and temporarily mount it on the Z1 truss. The pressurized mating adapter is attached to Unity with a system of motor-driven bolts making up a common berthing mechanism, or CBM. After Ivins locks the end of the arm on PMA-2's grapple fixture, computer commands will be sent to open all the CBM bolts holding the mating adapter in place. About one hour before the spacewalk begins, PMA-2 will be detached from Unity and moved to a point just a few feet away from its temporary mounting point on the Z1 truss. No problems are expected at this stage. If all goes well, that is. 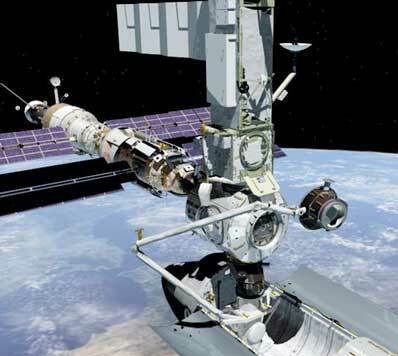 While the station's CBMs have been used to successfully lock components together, the removal of PMA-2 marks the first time the system will have been used to detach a component. In any case, Ivins should have PMA-2 in the "pre-install position" aside the Z1 truss just about the time Jones and Curbeam are floating out of Atlantis' airlock. "We have to remove PMA-2, and we don't even want the EVA guys to come out of the airlock until we've successfully unbolted PMA-2, using computer commands from the shuttle, and pulled it away from the node," Cockrell said. "And then, we're going to allow the guys to open the hatch and start their work." Jones will make his way up to the Z1 to assist Ivins in precisely positioning PMA-2 on the side of the truss. He then will use a power tool to drive four bolts closed, temporarily locking PMA-2 in place. Curbeam, meanwhile, will float to the far end of Atlantis' payload bay to remove contamination shields protecting the common berthing mechanism interface that will connect to the Unity module's hatch. He then will disconnect umbilicals providing power for the lab's heaters. Once that work is complete, the two spacewalkers will move up the station "stack" to the P6 solar array truss where they will unlock restraints holding a cooling radiator in place. The radiator will be deployed later in the mission. After unlatching the radiator restraints, Jones and Curbeam will remove a locking pin holding the steering system of the station's main Ku-band dish antenna in place. The antenna will not be used, however, until after the next station assembly mission. Ivins, meanwhile, will be using the robot arm to pull Destiny out of Atlantis' cargo bay. She will have to be very, very careful: There are only two-and-a-half inches of clearance between the sides of the lab at its widest point and the walls of the shuttle's payload bay. Keeping the lab properly oriented and within this tight tolerance would be a challenge to any arm operator. But it's even more so for Ivins because she will not be able to directly see the lab and its attachment fittings. "When we attach to the station, when you look out the aft window and the overhead window of the flight deck, all you see is station," she said in a NASA interview. "I mean, the station is six feet (away) out the window. "So unlike most flights where there is a robotics operator who's manipulating a large structure in the payload bay, we have no direct eye contact with the payload. We can't see it at all." Instead, she will use two television monitors on the shuttle's aft flight deck to display the output of four television cameras mounted in each corner of the cargo bay. "The lab is about as wide as the payload bay is," Ivins said. "I'm going to pull it out of the bay at about a tenth of a foot per second. So, it will take 20 minutes to get this thing out of the bay. "Then I have to flip it 180 degrees. Now, as it turns out, there is a keel pin on the bottom of the lab that holds it into the payload bay when we launch. I have to flip it over because a few flights from ours they will attach something to that keel pin." Because of limitations on the range of movement of each joint in the robot arm, Ivins cannot simply flip the lab over. She must move the arm through a complex pattern to accomplish her goal. "It's taken us about a year and a half to figure out what that path is," she said. "I can do that. So we flip this thing over and bring it down to the position of the node." At this point, Ivins will be able to take advantage of the view from a camera mounted by the station crew in Unity's hatch. She will see the lab from Unity's perspective, allowing her to fine-tune the final approach. If the lab is properly aligned, the cockpit crew will see four "ready to latch" indicators light up. At that point, the CBM mechanism will be activated via computer link to begin locking Destiny to the Unity module. "We will throw the latches and we will drive the bolts and I will start to breathe again," Ivins said. And what if one of the critical cameras breaks down? "I wake up at night in a cold sweat thinking about this," Ivins said in a pre-flight news conference. 'This flight and most of the other station assembly flights to follow are very highly dependent on these cameras because you have no direct view out the back windows. "There are some cameras that if we lose we are going to ask the EVA guys to go out and replace with another payload bay camera. We're really hoping that doesn't happen." With Destiny in place, Curbeam and Jones will move to a panel on the Z1 truss that provides connections for electrical and fluid lines running between the P6 solar array truss and the rest of the station. The spacewalkers will hook up nine electrical connectors between the lab and the Z1 truss and four fluid jumpers that will allow ammonia coolant to flow between Destiny and the P6 radiators. The nine electrical cables carry power from the solar arrays, computer commands and telemetry and electricity to repower the lab's launch-to-activation heaters, which were disconnected from shuttle power earlier in the spacewalk. "The ammonia lines - the fluid lines - are circulating cooling ammonia all the way up to the radiators on the P6 truss," Jones said. "And that provides an outlet for the lab's heat. The electrical power is flowing down from the solar panels down P6 through Z1, and that power is available at the end of these umbilicals that we then hook into the laboratory's connections. "And now we distribute this 120-volt electrical power into the laboratory so it can be distributed to the various life support, command and control and scientific functions later on. So we actually have a little fold-down tray on the end of Z1 that lays out these lines in a nice, orderly fashion. "We have to bend them across a few feet of space and then mate them to the laboratory," he said. "And both Bob and I reach in from opposite sides of this tray and spend about an hour doing all those critical connections." If the spacewalkers run into problems getting the power lines connected on the Z1 tray, a smaller set of cables will be hooked up between Destiny and Unity to provide emergency power to operate the lab's heaters until the other problem is resolved. Getting power to the lab is critical. While ammonia coolant carries heat up to the P6 radiators, water is used in the lab's internal cooling loops and without heaters, that water could freeze. The ammonia coolant lines are just as critical at the other end of the temperature extreme. In a sort of "Catch-22," the crew most power up the lab's computers and avionics system, which generate heat, to activate the cooling system necessary to remove it. 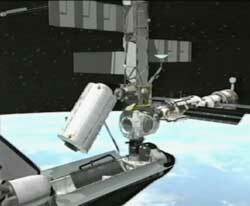 "There's about a four-hour window to accomplish this lab activation," said station flight director Andrew Algate. "When we start turning on the avionics, they require cooling. But to turn the cooling system on, we need to have the avionics on. "But we estimate the procedure here will only take about an hour and a half so we have a fair window here to get the job done." 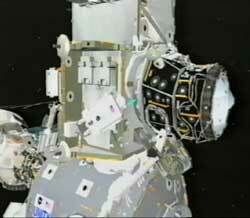 The spacewalk is scheduled to last six-and-a-half hours. The hatches between Atlantis and the ISS will be reopened about an hour after Curbeam and Jones repressurize Atlantis' airlock and internal electrical grounding straps will be hooked up between Destiny and the Unity module. Avionics powerup and coolant system activation will begin shortly thereafter. "The first thing that we do is we turn on the DC-to-DC converter units that are providing power to the systems in the lab," Algate said. "As soon as those units start converting power, they require cooling. "As we turn on subsequent components in the lab, the various computer systems required to turn on the thermal cooling loops, those systems also require cooling. So there's a period of time that's estimated to be four to five hours before some of those components start to overheat. "So the key is that within that window of time we start the coolant water flowing in the thermal control loops." The equipment is fully redundant. While no problems are expected, flight controllers are prepared for a variety of contingencies. "It's always possible just to shut things down" if cooling cannot be established in time, Algate said. "There's a separate heater system ... that will keep it warm while we troubleshoot any problems that we have." Flight controllers in Houston will continue Destiny's initial activation and checkout while the crew sleeps. 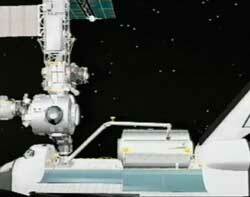 On Sunday, the astronauts and cosmonauts will finally float inside and lab activation will begin in earnest. Animation shows the PMA No. 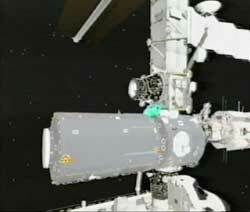 2 docking port being removed from the station's Unity node by Atlantis' robot arm and temporarily stored on the Z1 truss. 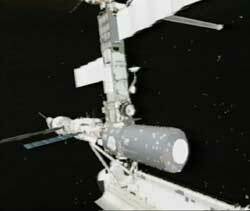 The Destiny lab module is lifted out of Atlantis' payload bay by the robot arm, flipped 180 degrees end-over-end, and connected to the station as shown in animation. Kerri Knotts, the STS-98 lead EVA officer, provides a detailed preview of the work to be performed during the mission's first spacewalk with complete animation.